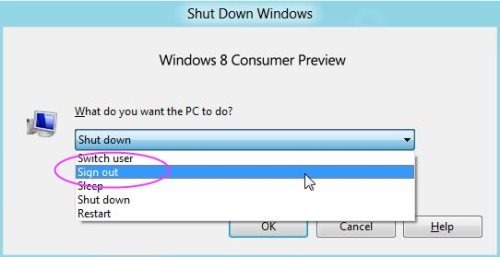 By now, most of you must be aware about Windows 8 login procedure. Yupp…you read it right. The very new Microsoft’s Windows 8 needs a Live ID and password in order to access features it provides. 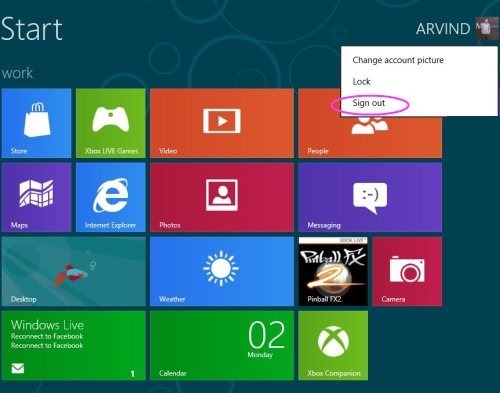 However, many got puzzled on how to sign-out from Windows 8 because every time they login, it automatically sign-in to Windows 8 Account. Hence, after a proper R&D, I came across three different methods of signing out from Windows 8. Signing out is required for multiple users using same PC. For this purpose, you need to sign-out from your PC before shutting down. This procedure maintains privacy and protection for all your data. Lets get started over with the methods. Type CTRL + ALT + DEL and select sign out from the option that appears. Click on Start screen, Take the cursor and click user tile at top right, and then select Sign out from the menu that appears. Open aero desktop on your PC, Type ALT + F4 and choose sign out from the list of option. Make sure that you follow the steps carefully to sign-out clearly. Go ahead and try out yourself.